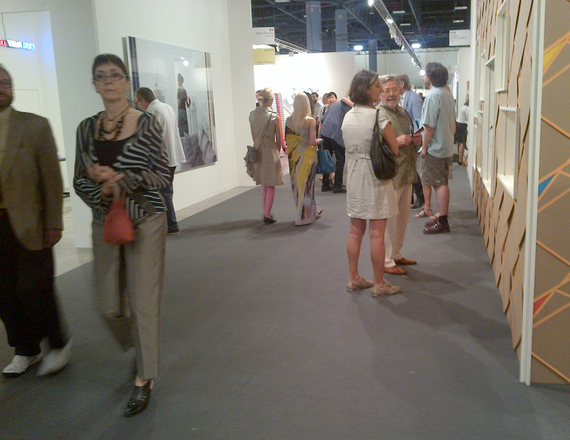 I went down to Art Basel Miami Beach Wednesday for the opening but had to come back because I have an exhibit Saturday. I don’t go to Art Basel Miami Beach for the parties but for the art. Miami in December is seductive, it is warm, sunny, blue skied and lined with palm trees. A noticeable change from gray New York. As an artist I’ve always been interested in the totality of the exhibition space — not only the artwork but how it is presented. In examining the gray concrete floors with mostly white walls it, to me, mirrors the New York/Chelsea gallery look which I am sure makes many feel right at home. A number of the galleries had exposed utility access panels in the floor, a regulated part of any convention hall. One gallery brought a floor of hardwood planking so you felt like you were walking on an uneven, unfinished boardwalk. Some of the galleries had white rugs or rugs in general which gave the space a polished look. The VIP opening is an exercise in sociology. There really are three separate VIP events. There is the VIP opening at 11 with the ‘premier’ VIPs coming en masse. It is also a time to run into your colleagues. I saw Whitney Director Adam Weinberg, who was trying to see art although everybody was trying to see him, had lunch with Madeleine Grynsztejn from the Museum of Contemporary Art Chicago who was with a young board member and friend. There seem to be a lot of invited VIPS in this first viewing slot. The second wave of VIPs come in at three and by the time the Vernissage starts at 6 with the third group of VIPs, it is very crowded. Most of the early morning viewers have moved on and if you are coming to hobnob with the stars, my guess is they have already left. After the first day I was happily exhausted, but there are other satellite fairs and venues to visit like Art Miami, Design Miami, NADA Art Fair, Scope Miami, PULSE Miami, the new Perez Museum, Bass Museum, private collections — there really isn’t enough time to explore all the offerings. I spent an entire day just moving from the back of the Convention Center for Art Basel Miami Beach to the front. There’s a lot of art, which isn’t to say it is all good, and there are a lot of art dealers trying to sell their wares. Download the map beforehand. I like to do this so that I can decide where I want to go and what I want to see beforehand, I always seem to get lost in the maze so a map in hand is helpful. Try to get there early so you can find good parking if you are driving. Start in the back, it usually is less crowded back there.